In 2003 the WCC was accepted into the Species Survival Plan (SSP) for the critically endangered Mexican gray wolf and has played a critical role in preserving and protecting these imperiled species through carefully managed breeding and reintroduction. The goal of the Recovery Plan is to restore Mexican gray wolves to a portion of their ancestral range in the southwest United States and Mexico. To date, the WCC remains one of the three largest holding facilities for these rare species and three lobos from the WCC have been given the extraordinary opportunity to resume their rightful place on the wild landscape. The 24 Mexican gray wolves at the WCC occupy four enclosures in the WCC Endangered Species Facility. These enclosures are private and secluded, and the wolves are not on exhibit for the public. Wolves in the wild are naturally afraid of people so the WCC staff follows a protocol to have minimal human contact with the Mexican wolves. This will ensure they have a greater probability of being successful if they are released into the wild as part of the recovery plan. The Mexican gray wolf (Canis lupus baileyi) is the southernmost and most genetically distinct subspecies of the North American gray wolf. From prehistoric to fairly recent times, the Mexican wolf, or lobo, ranged from central and northern Mexico to western Texas, southern New Mexico, and central Arizona. Our knowledge of the Mexican wolf is sketchy because wild populations were effectively eliminated before they could be studied. Most of our information about the animal in the wild comes from trapper’s journals and reports. Adult Mexican wolves typically weigh 65-85 pounds, average 4.5-5.5 feet from nose to tail, and stand 28-32 inches at the shoulder. They breed from late January through early March, and give birth to an average of four to six pups about 63 days later. Mexican wolves were found in a variety of southwestern habitats; however, they were not low desert dwellers. They preferred mountain woodlands, probably because of the favorable combination of cover, water, and available prey (deer, elk, javelina, rabbits, and small mammals). Like all wolves, the lobo is a social creature with an intricate system of communication and social structure. However, because the primary prey of Mexican wolves is smaller than the moose and caribou hunted by northern wolves, wolf pack sizes were probably smaller as well. A typical pack of five or six animals might consist of an adult pair and their offspring, with a territory encompassing up to several hundred square miles. Hunting behavior and strategies would vary with terrain, and prey size and availability. Wolves can and do occasionally kill livestock, particularly vulnerable young animals. However, in areas where wolves and livestock coexist, such as Minnesota, Montana, and Alberta, Canada, wolves take an average of less than one-tenth of one percent (0.1%) of available livestock. Mexican wolves were common throughout their range in the mid-1800s. Toward the turn of the century, high cattle stocking rates and low populations of native prey, such as deer and elk, caused many wolves to prey on livestock. This led to intensive efforts to eradicate wolves in the United States. Wolves were trapped, shot and poisoned by both private individuals and government agents. Bounties were paid. By the mid-1900s, Mexican wolves had been effectively eliminated from the United States, and Mexican populations were severely reduced. The Mexican wolf was listed by the U. S. Fish and Wildlife Service as an endangered species in May 1976, and was considered extinct in the wild up until their reintroduction in 1998 into Arizona and New Mexico. A few may remain in the wild in Mexico; however, their presence there has not been confirmed since 1980. Reports of Mexican wolf sightings are occasionally received from the United States/Mexico border areas of Arizona and New Mexico, and Texas, but none have been verified to date. The Endangered Species Act requires the USFWS to develop and implement plans for the conservation and survival of listed species. The objective is to recover species to secure population levels, maintain those levels, and then remove them from the endangered list. Under an agreement between the United States and Mexico, five Mexican wolves (four males and one pregnant female) were captured between 1977-1980 in Durango and Chihuahua. These wolves were transferred to the United States to establish a certified captive breeding program that is now managed for the Service under the American Zoo and Aquarium Association’s Species Survival Plan Program (SSP). In July 1995, two additional lineages of captive Mexican wolves were approved for addition to the SSP breeding program. The Ghost Ranch population in the United States and the Aragon population in Mexico City, both maintained in captivity since the 1960s, were previously uncertified because of uncertainties about their origins. However, recent advances in DNA analysis techniques have been applied to the populations, and they have been determined to be pure Mexican wolves. These lineages added 4 new founders and 33 individuals, to the total captive population. In March 1997, the Secretary of the U. S. Department of the Interior approved a plan to restore Mexican wolves to a portion of its historic range in Arizona and New Mexico. The final environmental impact statement was completed in December 1996 after 14 public meetings, three formal public hearings, and analysis of over 18,000 comments from other agencies, organizations, and citizens. In March 1998 the USFWS and its cooperators, Arizona Game and Fish Department, New Mexico Department of Game and Fish, USDA Wildlife Services, released three family groups consisting of 11 Mexican wolves into the primary recovery zone on public lands within the Apache National Forest in eastern Arizona. Two additional wolves were released later that year. The Service and cooperators released three additional breeding pairs in 1999. Additional family groups will be released each year until natural reproduction sustains wild population growth. Reintroduced wolves are allowed to disperse throughout secondary recovery zones in the Apache National Forest and the adjacent Gila National Forest in New Mexico. The two forests are designated the Blue Range Wolf Recovery Area. Released wolves and their offspring are designated a nonessential experimental population in a special regulation (rule), which defines management guidelines, including provisions for removal of wolves that depredate livestock. Wolves are not allowed to establish territories outside recovery area boundaries. Dispersing wolves will be recaptured and relocated back to the recovery area or returned to captivity. What is the Mexican Gray Wolf Species Survival Plan? 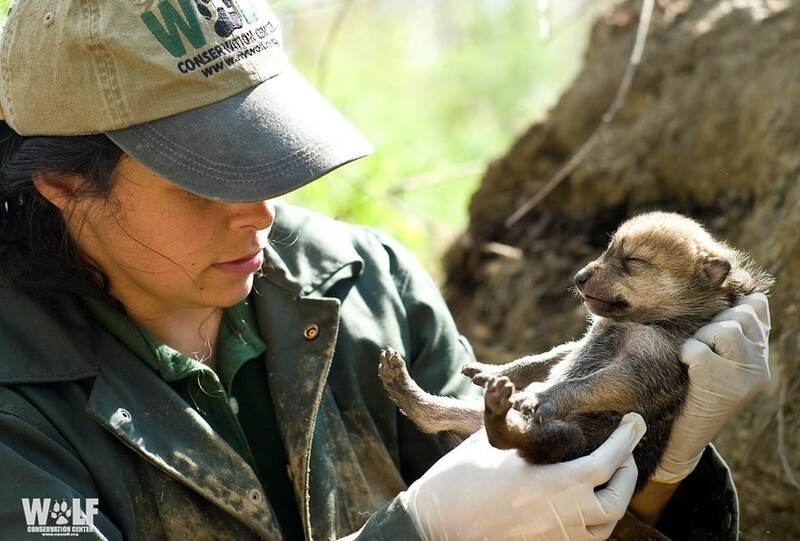 The MWSSP is a bi-national initiative between the U.S. and Mexico whose primary purpose is to support the reestablishment of the Mexican wolf in the wild in both the United States and Mexico through captive breeding, public education and research.